Paeonia Sunny Girl is a full-petalled hybrid with heavy, dark green leaves. The large flowers have a summery, butter yellow colour, with a subtle red tinge in the outer petals. Its lovely colour will brighten up any room. 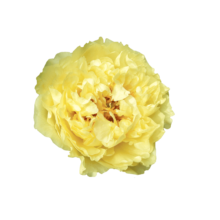 At this moment Sunny Girl is the most double, yellow variety in our assortment. The flowers are more filled than Lemon Chiffon for example. Sunny Girl is a seedling of Moonrise, from whom it has inherited the same butter yellow colour. The shape of the flowers is different though, as Sunny Girl is double flowered. Furthermore there is a small stripe in Sunny Girl noticeable. Sunny Girl is a creation of the famous breeder Chris Laning and is registered in 1985. Other varieties of Laning are Lois Choice and Sunny Boy. The heavy flowers of Sunny Girl could use a little bit of additional support as the green stems are beautiful, but slight. That’s why we recommend putting Sunny Girl in a vase with a high neck. Finally, cut the stems diagonally, add some sugar to the lukewarm water and be prepared to welcome summer into your home!